A blinding snow squall whipped through upstate New York this afternoon, followed by a precipitous drop in temperature. The temperature’s already below zero here at Snyders Lake, and it promises to plunge even further before dawn. I was planning to go to an open mic in Troy tonight, but I couldn’t bear the thought of braving the cold. At least I’m better prepared than last week, when we forgot to leave the basement space heater on and the taps dribbling at night, and the pipes froze solid. Spend a day exploring ways to empower your imagination in writing. Through creative visualization, writing and art, you’ll digdeep into the sources of your creativity to bring forth gems you can use in your writing. We’ll take imaginative journeys to find our personal power sources and explore ways of working with dreams for insight and inspiration. Whether you’re drawn to poetry or prose, fiction or nonfiction, you’ll identify ways to pursue your writing projects in the future. All levels of experience welcome. Handouts will include suggested reading and resources plus writers’ tips on maximizing your creativity. Some materials supplied, but you may wish to bring a journal and your favorite writing instruments. In today’s vibrant poetry scene, practically anything goes. Spend a day exploring ways of transforming your experiences and inspirations into poems in a variety of forms. In this workshop, there are no “good” or “bad” poems. Rather, you’ll receive guidance and gentle encouragement to distill your ideas into fresh forms and learn techniques to use long into the future. You’ll learn about the local poetry scene, with its many open mics where participants at all levels are welcomed with enthusiasm. Whether you’re convinced you can’t write poetry or you’re a more experienced writer looking for fresh ways to boost your creativity, you’ll find plenty of inspiration. Handouts provided; bring your favorite journal and writing supplies. REGISTER NOW TO WIN A FREE NOVEL! 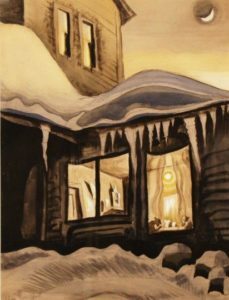 To register for one or both workshops, visit the ACCR website at www.artscenteronline.org. Don’t delay. The poetry workshop is definitely happening, but I need more people to sign up for the day dreaming workshop on February 9th to make sure it’s a go. As a special incentive, I’m offering a free copy of one of my novels to the first two people who register. If you do, let me know by emailing me at julielomoe@gmail.com. 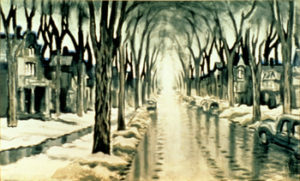 Charles E. Burchfield (1893-1967) grew up in Ohio but moved to Buffalo, New York as a young man. 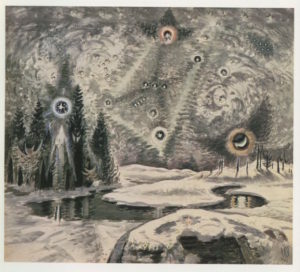 He worked as a wallpaper designer but later supported himself through his art and was widely recognized as a visionary artist, working exclusively in watercolors. 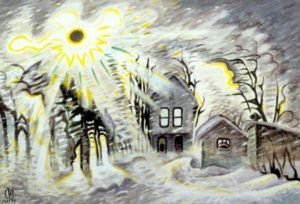 I’ve seen and loved many of his works in museums in western New York State; the largest collection of his work is at the Burchfield Penney Art Center in Buffalo. Keep warm, and let’s keep in touch. If you haven’t already, please subscribe to my blog by clicking in the box on the menu at the right.